It's not every day that a friend's book is #3 #2 on the Amazon Mystery Bestseller list. After a year on the shelves, and some very positive press, Stephen Parrish's treasure hunt adventure novel has skyrocketed to the top of the charts. Here's the deal: the book's Kindle price has been lowered to 99 cents. You can choose to buy it for your Kindle OR you can download (free & easy) the Kindle app for your PC or Mac and get the book that way (also for $.99). I bought the book way-back-when for $13 and it was worth every penny then. So this new price is an amazing bargain. However. Steve, being the generous guy he is, will BUY a review copy of the Kindle version for you, if you leave your email address in the comments. You MUST, however, actually download the book in order for it to count towards sales. 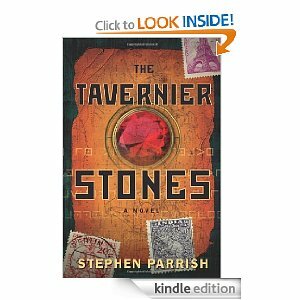 I've talked about The Tavernier Stones on this blog before. Steve has been actively promoting the book for over a year, in addition to supporting his friends' books and quietly critiquing and reviewing their work. Nobody deserves this more. Feel free to post a link on your blogs or FB, etc. Let's help it go to #1!